I want you re-introduce you guys to my good friend Molly Sohr of The Cedar Lane! Molly is a wedding/event planner and lifestyle blogger. You might remember her from our Galentine's Brunch back in February. With years in the planning industry, Molly realized that her passions are executing creative ideas into tangible + special memories for others. Funny enough, this time last year Molly was telling me about her idea for her new career path and the idea behind The Cedar Lane. I had recently quit my full-time job and I told her she had to run with the idea and go after her dreams. It's so fun to see her doing her thing and in her element. Molly perfectly blended our styles for this impromptu summer soiree we had been wanting to plan. She incorporated a lot of fun, colorful and affordable items from Target's new Opalhouse collection with some of her staples from local Nashville favorite Hester & Cook. I brought over a bottle of David Arthur Analyce Rosé I had been itching to open. This Rosé is a layering of mostly Cabernet Sauvignon and Sangiovese Saignée. The result is a delicate and fruity wine that quite literally tastes like summer in a bottle. I've recently become a huge fan of this family-owned vineyard and hope to visit their grounds in Napa one day! This fun and vibrant setup would be perfect for a small get together. 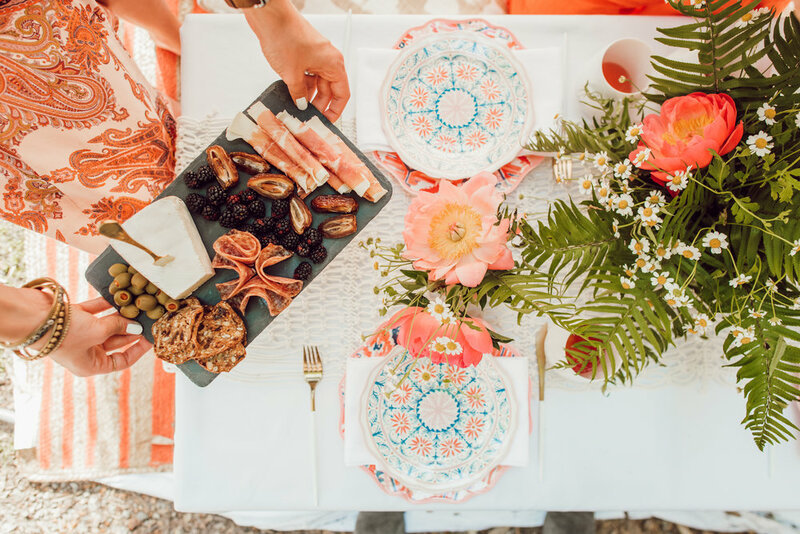 The items are linked below if you feel inspired to recreate or put your own spin on a summer party of your own! Call up some friends and grab a bottle of your favorite rosé. No matter how busy you may be, it's so important to make time to catch up with friends.